In previous versions mIRC returned in Whois this identifier $emailaddr but currently when I do Whois to a nickname does not appear the information of this identifier. It's normal? If the answer is yes then tell me what the Email field in the Connection Window is for because I do not understand. Are you talking about the Username portion of your own $address being reflected by $emailaddr instead of Ident? Then see this thread. This topic does not clear my doubts. 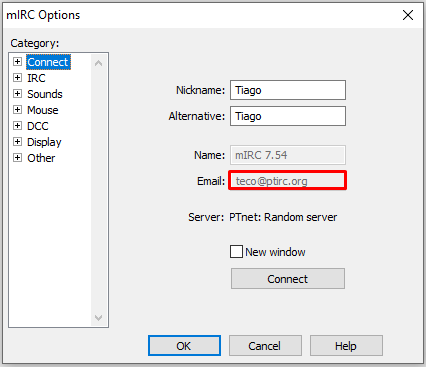 When I am connected to a network, when I see the whois of a nickname, the real name appears (mIRC 7.54) but the email field does not appear, and the email field is filled in with mIRC. 21:03 Tiago End of /WHOIS list. If this information does not appear in the whois, then what is this field currently for? 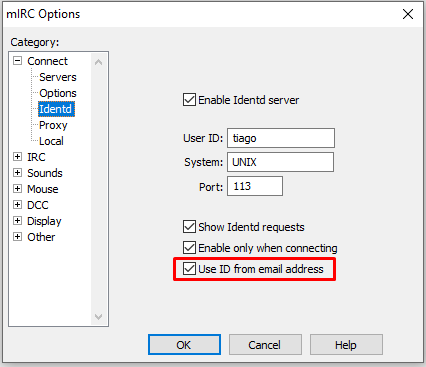 ~ before your ident means the server could not connect to your identd so it used your USER instead, which appears to be taken from the email. Or maybe different servers use different fields when there's no ident response. IRC and mIRC never ever displayed a person's email address in their /whois information. It would be by sheer coincidence, and classical UNIX computing, your ISP or University(ISP) had your IP address resolve to their corporate domain name, and your Ident would resolve to your account Username that was also your email address with the ISP or institution. But that would have always been pretty rare. All right. Now I realized the usefulness of the email field in the mIRC Options dialog.